We sit around the campfire, taking in the heat and light, the warmth and the sense of safe haven. It's probably always been that way, fire being mesmerizing, a source of power. The ancient Greeks named their god of the fire and forge Hephaestus, patron of metal working for tool, weapon, and art. Even now, it's difficult to watch a blacksmith at work or to view a photograph of a smith seemingly elbows-deep in fire and to not experience some of that primeval awe embodied by fire and light. 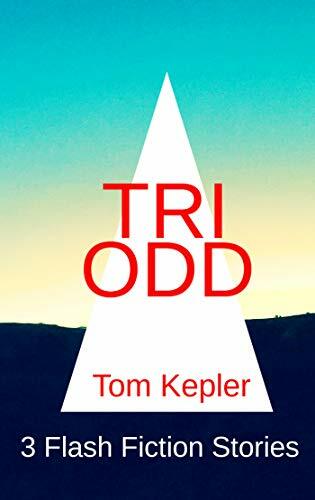 It's difficult not to perceive a cinder-scarred, sweating blacksmith as somehow a human equivalent of the workaday, mythic Apollo, who daily pulled the sun across the skies in his chariot of fire. In Florida, that warm land of sunshine, resides a blacksmith who like Apollo, owns a chariot--or tiny trailer--forged with his own two hands, with his wife's help. 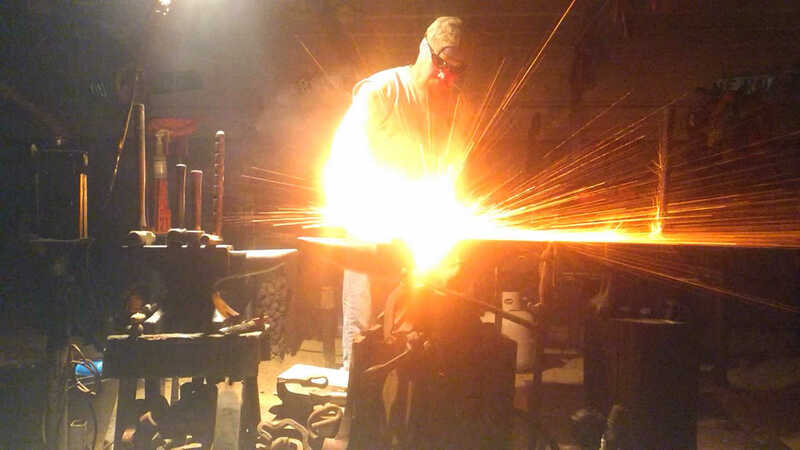 Chuck Fowler is a blacksmith by trade, following a family tradition. 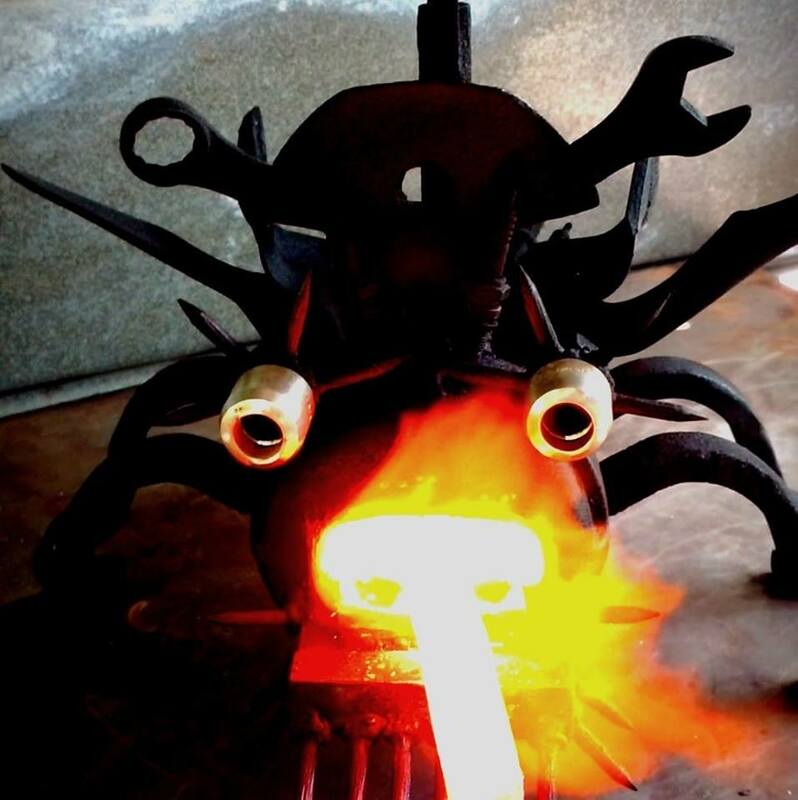 He says, "Blacksmithing is the art of moving metal with extreme heat with a hammer and anvil. I was taught the trade by my father. My wife and I have a large workshop at our house where we do metal fabrication work, blacksmithing and bladesmithing, and custom artwork and painting." The editors of Encyclopaedia Britannica tell us that a blacksmith is a "craftsman who fabricates objects out of iron by hot and cold forging on an anvil." The use of iron replaced bronze a little over two thousand years ago, and iron was shaped by hand until the Industrial Revolution, which began in the late 1700's. "The blacksmith’s essential equipment consists of a forge, or furnace, in which smelted iron is heated so that it can be worked easily; an anvil, a heavy, firmly secured, steel-surfaced block upon which the piece of iron is worked; tongs to hold the iron on the anvil; and hammers, chisels, and other implements to cut, shape, flatten, or weld the iron into the desired object." Chuck's skill with fire and hammer and his wife Lo Flo's artistic talents were put to work when they combined their talents to create their tiny trailer. 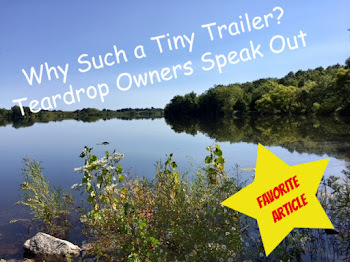 "My wife and I combined our abilities to create our one-of-a-kind off-grid camper. 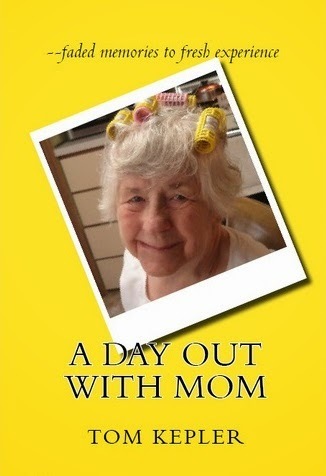 We wanted something a little different than the norm. My wife did the unique paint job, and we both pitched in on the heavy fab work on the trailer. We pull the camper with our Subaru Forester, and the combination has worked out great." Chuck's trailer is homemade (not surprising for a blacksmith/metal worker), topped with a "an old slide-in universal truck camper," of which only fifty were made before the company folded. "It was a lot of work but well worth it," Chuck says. "The camper was made by a company here [in Florida] that made a very short run on them before going out of business in the early 90s. We modified the inside of it, and it now sits on a handmade trailer with a back porch and custom swing-out cook tables." Chuck's wife adds, "The company that made our camper was in the surfboard business out of California. This model was made to fit a surfboard inside that would have hung from the roof. Very cool, nostalgic tiny house for us. Surf's up!" 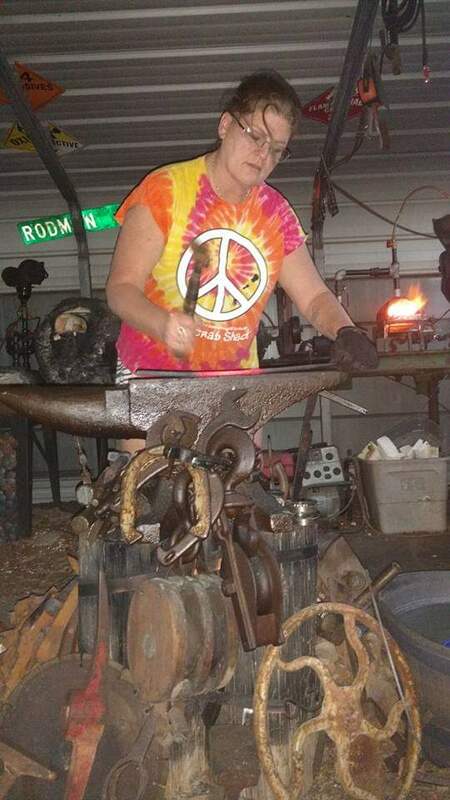 Chuck's blacksmithing craft has done much more than create a home-away-from-home camper for them, though. He uses his skills not only for the utilitarian but also for art. One aspect of his art and craft is bladesmithing. 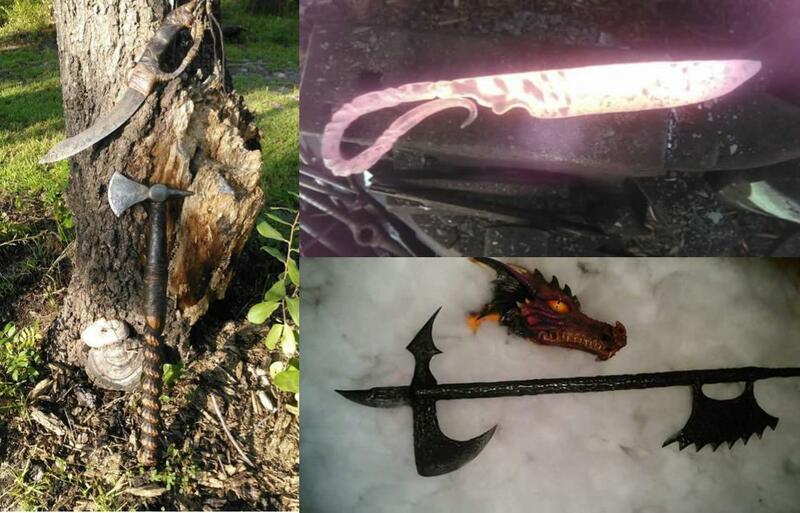 The weapons in the photo montage below are examples of Chuck's weapon-making work. The axe and knife on the left were inspired by African tribal weapons. They have handles wrapped in leather and sinew. The bottom image of the large war axe was inspired by J.R.R. Tolkien's Lord of the Rings trilogy. "The orcs in that movie," comments Chuck, "carried some serious weapons." The top right image of the glowing knife on the anvil "is going through a cycle of stress relieving." The blade was all hand-forged, requiring several stages of heating and hammering. "One of the last things you do to a knife before you move to the heat treatment of the steel is stress relieving. At this point the blade is heated up to forging temperatures many times and placed on the anvil and hammered into shape. Certain stresses could build up, causing the blade to warp in the quench. Basically, you're hardening the steel. Then you must fall back and temper the blade, pulling some of the hardness back out of the steel in order to be able to sharpen and maintain the blade." The History Channel's popular show Forged in Fire premiers four bladesmiths each episode who compete for $10,000 in a timed event, usually requiring materials that will push the smiths to the limit. 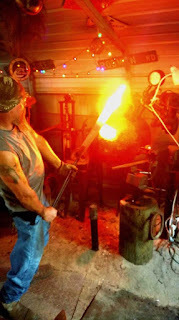 Last year (2018) Chuck, along with another smith, Bill Benke, were separately highlighted on the episode "The Anthropomorphic Sword," Season 5, Episode 21, where he gave a tour of his home forge for a bonus scene. small, portable forges that are also works of art. Able to craft not only larger or deadly objects, Chuck is also able to create more delicate and intricate work. "The bodies of the dragonflies [below]," Chuck explains, "are fashioned from 3/8-inch round stock. The bodies are tapered down to a point using a rounding hammer. Then they are run through a guillotine tool, creating the segments in their bodies. 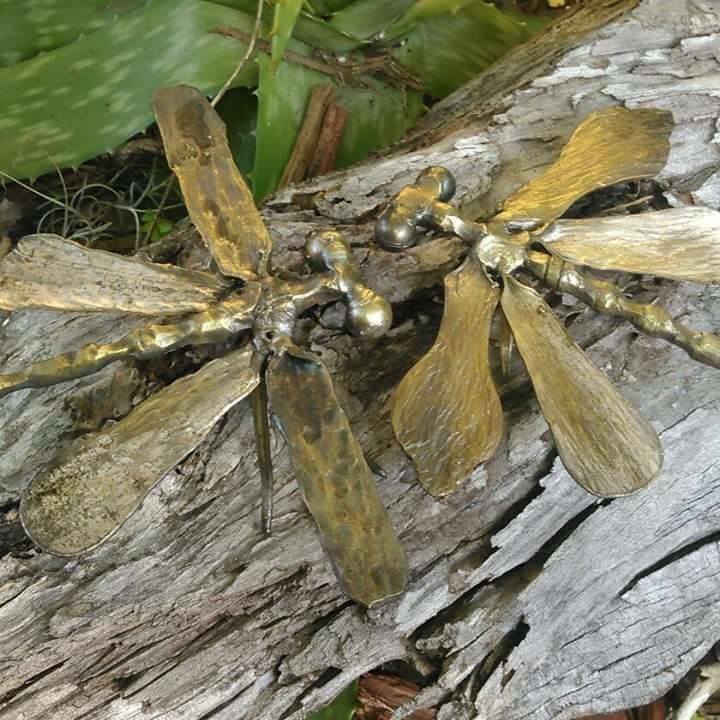 The wings are recycled stainless steel spoon handles shaped and chiseled on the anvil to give the look of the vessels you see in a dragonfly's wings. The eyes are simply small ball bearings." After the forge work is completed and the individual pieces of the dragonflies are constructed, assembly begins. "They're assembled with a tig welder. Then my wife cleans them up with a wire brush and gently heats each one up with a small propane torch and wire brushes them down with a brass wire brush. The brass transfers over to the steel, producing a bronze effect on the steel." With spring on its way and living in the beautiful state of Florida, the time is coming for Chuck and his wife Lo Flo to head out and immerse themselves in the beauty of nature, relaxing from the bustle of work and finding inspiration in the world around them. Chuck says, "As far as traveling with our rig, we're fully equipped for off-grid camping, so the sky's the limit." They have plans of visiting places in south Florida, such as Lake Okeechobee, which, according to Chuck, has some very nice campgrounds and "even free-ranging, exotic reptiles." So no one will be surprised if some of Chuck's new art has its beginnings in a dragonfly landing on a green tropical plant near their tiny trailer . . . or maybe an alligator, lazing in the sun, which is the forge of life. I enjoyed writing this article and was able to learn more about iron working. That's one of the great benefits of having a blog. Thanks for reading GGG and thanks for responding.